Almost two years ago the first Fantastic Beasts and Where to Find Them and in the final moments of the movie it was revealed that Johnny Depp would be playing Grindelwald. In that moment we wrote an article talking about how Depp’s presence shattered the magic of the movie. We are now in the second entry into this series and Depp has a much stronger presence in the movie. Instead of being in one scene he’s everywhere and we see him all the time. While his presence caused a hairline fracture in the first movie and broke the immersion but only at the end now he keeps appearing and breaks the immersion to the point where it’s hard to get lost in the movie. Depp has had quite the fall from grace in recent years. He used to be a huge box office draw who could bring in millions of dollars on name alone. However, allegations of abuse toward his ex-wife Amber Heard along with other allegations about Depp’s lifestyle have very much tainted the actor. Johnny Depp’s personal life has become impossible to separate from the characters he plays, and instead of seeing a character on screen all you see is Depp. Grindelwald is supposed to be a magnetic presence whose mere words can mystify, terrify or instill loyalty. He is supposed to inspire by not only presence, but by his message and his words. Warner Bros. thought they had this, and that’s why Depp came out on stage, in costume, at San Diego Comic-Con this year. In the movie, however, it does not work. Depp has been sleeping his way through roles recently and while he seems more awake here, he still isn’t that dynamic presence that Grindelwald is supposed to be. Grindelwald is passionate and magnetic, while Depp looks like he’s there to collect the paycheck. 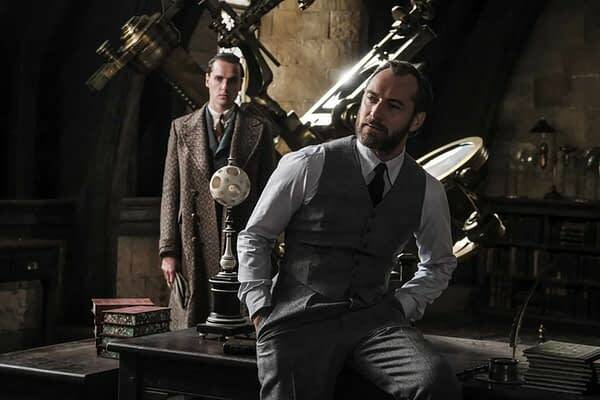 The thing that makes it all the more baffling is that he is supposed to be the adversary of Jude Law as Dumbledore. Law, on the other extreme, seems to have very much lost himself in this role. If there was anyone who could inspire an army it would be him. He’s the magnetic presence in this movie and despite not sharing a single scene together he completely dominates Grindelwald and Depp on presence and sheer personality. The odd thing about this entire thing is that Depp is the hill they decided to die on. This was a role they could have very easily recast. It’s a world where anything can happen, there is actual magic, and in the previous movie Colin Farrell was an alluring and mysterious presence. It was jarring to lose him in the last movie but this one feels like one long missed opportunity. Boo Berry, Franken Berry, and Count Chocula Film? Yes Please! And You Could Make it!